This article: Isn't it Obvious? Due to the immense popularity of Eli Goldratt’s book The Goal, his Theory of Constraints (TOC) is often equated with maximally exploiting a resource of limited capacity (a bottleneck). 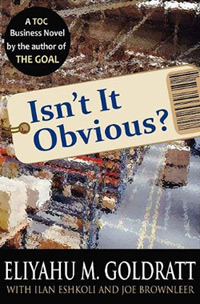 However, it is much more than that, argues Goldratt (1947-2011) at the end of his last book “Isn’t it obvious?”. I agree: The core of the TOC is mapping causes and effects, to find ground breaking business opportunities to focus on. The cinematic book Isn’t it obvious not only shows what can be accomplished with the TOC in a retail chain, there is also a deeper message in it. Good solutions are often based on correcting wrong assumptions. Therefore they often look embarrassingly simple, once you found them (remember Archimedes yelling Eureka?). However, that does not mean that everyone will accept these ‘obvious’ solutions at once! Hidden in the text, there is therefore cause and effect logic to be used for change management. Maybe it is time to substitute TOC (Theory of Constraints) by TOCE: Theory of Cause and Effect. Nowadays, the TOC is much more than a theory which says that you should maximally exploit resources of limited capacity, read: constraints or bottlenecks. A better definition is, according to me: TOC is a method which maps causes and effects, with the idea to find hidden constraints (which can also be erroneous assumptions or even mental blockages) and thus ground breaking business opportunities. This broader definition of the TOC also paves the way to combine strategy & tactics trees with other improvement approaches on an operational level, especially Lean manufacturing. In my opinion, the demand driven replenishment solution for retail described in the newest book of Eliyahu Goldratt is a clear example of that! Isn’t it obvious reads like a film script. You can even smell the odor in the basement of the retail store, after it is flooded with water! Some parts of the story must be based on real people and places; otherwise this book could not have been so true to life. But there is also another explanation why this book is so cinematic: Ilan Eshkoli and Joe BrownLeer, co-authors of the book, are professional writers of TV and film scripts. If you think you don’t need this book for your business, you could certainly read it for fun! I could easily imagine Isn’t it Obvious as a movie, although that would not have worked for me. As always, when I read one of his books, Goldratt makes me think, so I need time between the chapters to weigh the ideas described. Reading the first chapters, the comparison with activation energy forced itself upon me. In chemistry, if two chemicals can react to a state of lower energy (compare this with altering a business process so that this performs better), often an amount of activation energy is needed to push the chemicals over the hill. I think this is the same with people: they need activation energy to act, and often this energy comes in the form of an emergency situation. That idea in itself is not new: managers I interviewed often say that they deliberately created a so-called burning platform, which means that there is no alternative then to move, otherwise you burn your feet. Goldratt however goes a step further: he sees everything, also problems you didn’t ask for, as an opportunity to experiment and learn! In retail, and especially in the apparel sector, most managers think that everything should be ordered in advance, based on a forecast. However, the result will be shortages in high running articles soon. In addition, there are a lot of left-overs at the end of the season, to be sold as “outlet sale”. As Goldratt already explained in his book The Choice, there is a much better solution. Make yourself less dependent on a forecast, start with only a little stock in your shops, and replenish based upon consumption the articles which turn out to be high runners. In Isn’t it Obvious, Paul White is store manager of a shop within a large retail chain. He sells textiles like towels, table cloths and placemats. In the beginning, like most other managers, Paul still thinks that the only way to operate is to have huge amounts of inventory. That popular articles still will be sold-out when late customers want them, is simply a fact of life. Paul wished he had a crystal ball to predict the behavior of his customers. The Indian company Liberty Shoes, a large leather footwear manufacturer, has implemented Goldratt’s TOC for retail solution. This is described by Mahesh Gupta and James Cox in their article ‘built to buffer’, published at apics.org (in 2012). Liberty Shoes exploits the fact that an aggregated forecast at a central warehouse is much more accurate than the forecasts of individual shops. The inventory in the central warehouse is communicated daily to the five factories. Next, these factories replenish the shoes in the warehouse up to certain buffer levels. Shoes of which the stock buffer in the warehouse is in the red zone, meaning a high risk of stockout in the shops, are produced first. In the shops relatively little stock per item is maintained. Per item only just enough to be able to replenish it in time when needed. To this end, the stock levels in the shops are communicated daily to the central warehouse. If the buffer levels for a certain item are almost continuously in the red, the shoe concerned is identified as a ‘fashion winner’. In that case the buffer targets for that shoe are increased. With the suppliers of raw materials a similar buffer replenishment system was set up. As a result of this new approach, the overall inventories of Liberty Shoes are down by 50%, overall sales are up with 20%, and the inventory turns tripled. In the past, Liberty Shoes had a two season planning, pushing the shoes as close to customers as possible. This means producing a lot, and hoping to sell those shoes. Now, new products are introduced eight times a year in small quantities. Only after a new shoe has been proven to be popular, the production of that item is raised. So, essentially this is a market-pull system! Then a blessing in disguise happens, in the form of an emergency: A waterpipe bursts in the ceiling of the storeroom. Paul and his employees are able to save most of the inventory, but they can’t use their storeroom for months. Paul acts quickly, and relocates nearly all of his stock to the regional warehouse. Only small amounts he keeps on the shelves of his shop, and he persuades the regional warehouse manager to replenish daily what is sold. The remarkable side effect: his store makes suddenly the highest profit in the whole retail chain, written in double digits!